South Africa is always thought to be filled with wildlife in every corner of the country. Conversely, current wildlife populations of animals are plummeting due to habitat loss and human encroachment. Kevin Richardson strives to bring a change in this situation. He focuses more on the big cats, especially lions as many people feel that since lions are dangerous predators who can kill humans without much effort, they can protect themselves or they do not need protection from humans. However, the lion population in Africa has plunged from 350 000 to an estimated of only 25 000 within 15 years. 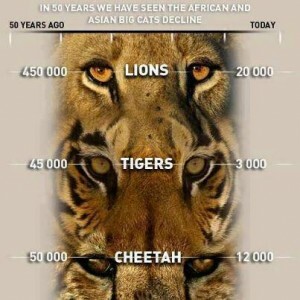 This is due to trophy hunting, poaching and habitat loss. The Trophy Hunting Industry in Africa has been thriving for a long time. 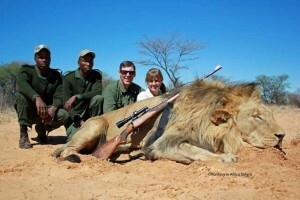 Lion hunts reap more than 90 million dollars a year for the country according to the Professional Hunters Association. This is a lucrative business for all those involved. One of the statistics show that from 2006 to 2007, more than 46 000 animals (1050 lions) have been killed by 16 394 hunters, most of whom were rich foreigners. These foreigners sometimes pay up to $58 000 to kill a fully grown lion and $10 000 for a fully grown lioness. Even the government supports this sick sport due to the revenue and some provincial governments sell permit that authorize the hunting of rhinoceroses, lions, elephants and giraffes. The population decline of the big cats worldwide due to trophy hunting. Image Source. Another form of trophy hunting is Canned Hunting, where lions that have grown too old to do “cub duty” are sent to meet their demise. These lions are released into gaming reserves or parks and allowed to roam about. Meanwhile, hunters are also permitted to enter this reserves, looking for these lions, hunting them down and killing them. This cruel form hunting leaves lions defenceless and unable to run as they are enclosed in the reserves and were raised in captivity which means that some of their wild instincts may not be there. But even then, some hunters believe that this form of hunting is fair as hunting in the wild and there are the same risks involved and hence should not be banned. Richardson tries to increase awareness against these hunting methods and through his documentaries, advice people against the scams that they unwittingly reinforce which indirectly supports this hunting. 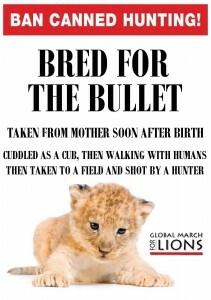 A poster against Canned Hunting of Lions. Image Source. Tourist often engage in petting young cubs in the zoos while on their tours and misinterpret this action as providing resources for cubs. 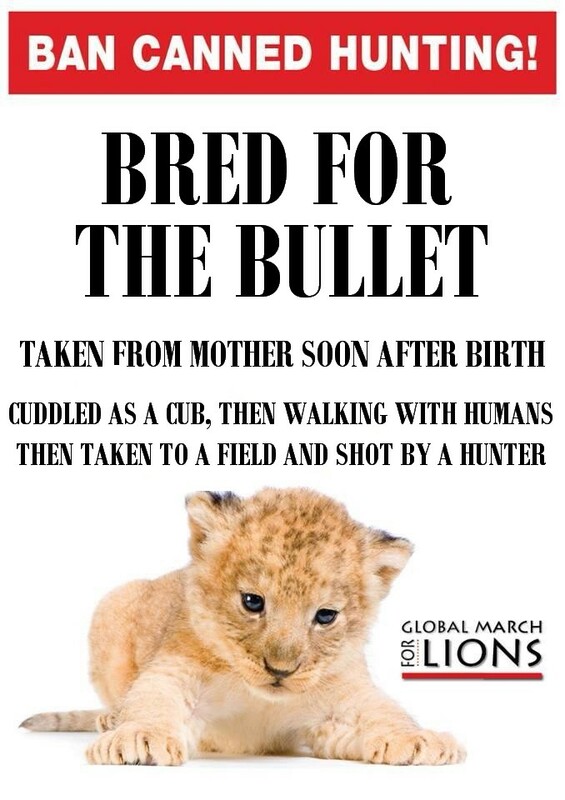 However they fail to realize that they instead reinforce the idea of breeding captive lions to make more cubs so as to increase the revenues gained from the “cub duty”. However, after the cubs grow too old, the tourist do not realize that unfortunately, these cubs will be handed over to the Canned Hunting Industry to meet their end or stay in captivity for their entire life, breeding more cubs which face similar situations. A poster against petting the cubs. Image Source. Recently, a new industry has risen exploiting the sale of lion bone materials. Similar to the mass poaching of rhinos for their horns, lions are being killed for their bones. The locals in South Africa can make up to $6 000, just by killing a lone lion and harvesting its meat and bones, which is roughly equivalent to their annual income. Previously, using Asian tiger bones wine to boost the virility, now lion bones are used as a substitute. One case of such wine can be said to reach a price of US$25 000 among the Chinese. This highly profitable scheme has caused the locals to redouble their efforts in hunting down the lions. 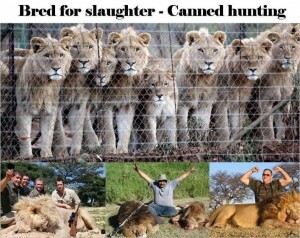 Poaching of Lions in South Africa by foreigners. Image Source. In Africa, human population has been projected to grow at an alarming rate, and is projected to double from 1 to 2 billion by the next two decades. This sharp rise in the population results in severe consequences for nature as more land is needed to provide for the human population and its needs. Almost 75% of the animals’ natural habitat has been converted to grazing fields or villages for the people. Currently, the lion population is said to be only occupying 20% of its previous habitual areas. 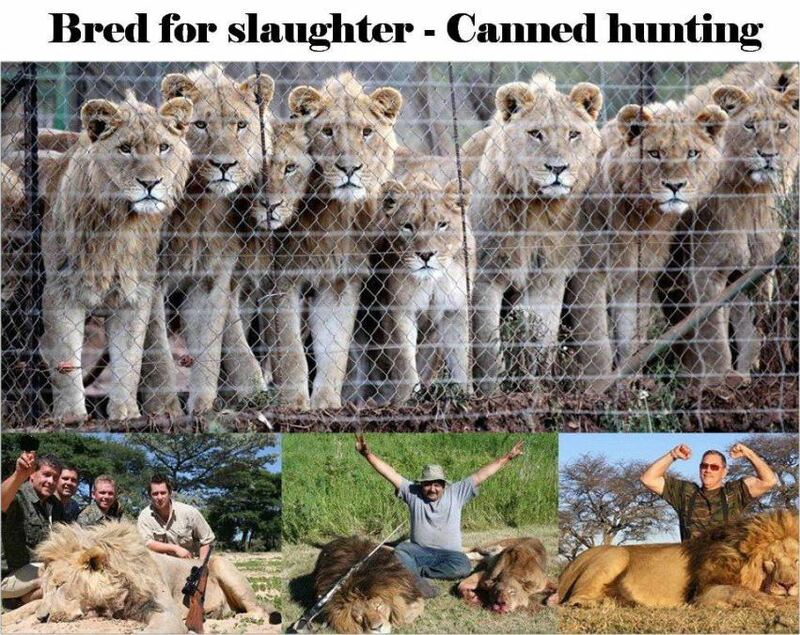 The farmers also end up killing hundreds of lions and other predators annually in retaliation for attacks on their life stocks. The untouched wilderness of Africa is fast vanishing under pressure of its growing population and Richardson and other environmentalists also fear that soon it would be reduced to just zoos and pockets of fenced in game reserves. No more wilderness and no more wild animals if such a state were to rise in Africa. 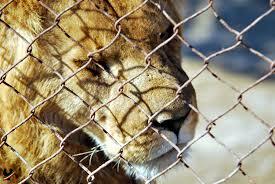 The plight of a captive lion. Image Source. Thus, Richardson hopes that through the media attention that his controversial techniques has attained, he would be able to raise awareness and educate the public on the importance of protecting and conserving Africa’s animals and its wilderness. Richardson is actively campaigning against the mass breading of cubs in captivity too as it is the cause for the increase in cub petting and canned hunting industries. If the crisis is not averted, there is a probability that in 20 years, there could be no more wild lions roaming the African wilderness.